It seems there’s been a few articles in the news recently about Cell phones and GPS “signals”, and how SAR uses them. Last week, North Shore Rescue helpfully pointed out some perceived flaws in the system. That same week, Comox Valley SAR executed a rescue where the subject’s phone was a key element in determining his position, and rescuing him quickly. And this very day Kelowna SAR is rescuing two sledders in the Myra Canyon area; their location again determined by using a cell phone’s GPS. So what’s the issue; do cell phones work, as illustrated in the latter two rescues, or are the positions completely inaccurate as North Shore Rescue seems to be saying? Well, it turns out the answer to this question is complicated. There are several systems under consideration here. The first is the cellular network. The basis of the cell phone is that the signal from the phone is tied to a tower. As you move from place to place, the signal is handed over to whatever tower’s area you are moving into. The key is that the cell system knows approximately where your phone is at any given time because it knows which cell towers, and which antenna on those towers are getting the best signal. This allows the system to triangulate the position of the cell phone by using the location of the tower, the strength of the signal, and the antenna’s direction. This is explained in much greater detail in this Wikipedia article. The position determined by the cellular network is referred to as the network position, or the rough position. It’s not very accurate because it depends on a lot of different factors. It’s most accurate when the towers are encircling the user, and spaced fairly evenly about the compass. It’s the least accurate when there is only one tower, or they are all in one general direction from the user’s location (i.e. : all to the south, or east), and they are even less accurate when the signal is weak. The second system under consideration is the Global Positioning System. Many phones also have a chip that allows them to receive signals from satellites and calculate their position on the surface of the planet. The accuracy of the calculation depends entirely on the number of satellites that the phone can “see”, and the quality of the signal from those satellites. The GPS determined position is known as the “fine” position. Phones will generally display your position on a map. Getting the phone to actually tell you the latitude and longitude is another matter. Even worse is getting the phone to tell you the accuracy of the calculation, more on that below. Both iPhone and Android phones have another way to determine the rough position of the phone by using the “SSID” of wireless routers and access points that are in range. This generally doesn’t work in the backcountry. Most of the issues around using the signals from a position determined from a cell phone are based on misunderstandings on the accuracy of the position, some of which are promulgated by TV shows such as CSI and 24. These misunderstanding even have a name: the CSI Effect. When a SAR team asks the cell phone provider to get the location of the phone, the provider is probably only going to be able to get the rough network location. With some phones and some providers it is possible to get the phone’s fine location, but in general the complications of how providers set up phones and how phones communicate with the network have made this an impractical set-up. This seems to be the situation North Shore Rescue seems to be commenting on, which stems from unreasonable expectations of the network location. Even slightly remote wilderness locations such as the North Shore Mountains have spotty and marginal cell coverage, tend to be to the north of all of the cell towers, and result in very poor network locations. The single most important piece of information to get from the mobile phone company is an estimate of the error in the position they are giving you. Without this a SAR team has no idea how accurate the position is, and how to even treat the information. The second most important piece of information is the time that the fix was obtained by the network. If a phone is turned off in the parking lot, the network will report the last location as being where the phone was turned off. Similarly, if the phone can’t get a cell signal, the network assumes the phone is still in the last place it had a good signal. In 12 years of SAR work, only one network determined cell phone location has provien to be accurate, and that was for a phone in the middle of a built-up industrial area with perfect mobile coverage. Several locations provided by the phone companies have been 10km from where the subject was located. 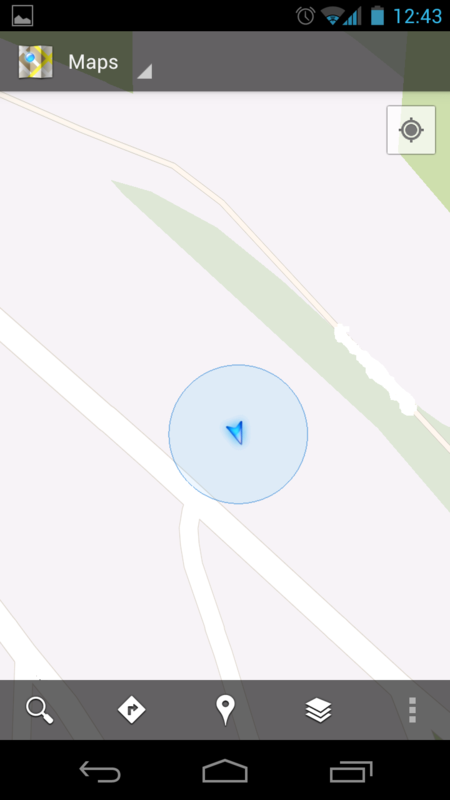 The phone can determine it’s fine location using the GPS, but it needs a good signal, and several satellites to do this. Rain, clouds, tree canopy and other factors interfere with the signal, and make the determined location less accurate. 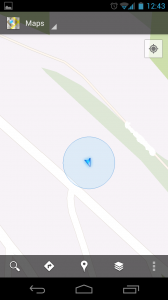 Position (triangle) showing error (Circle); Google Maps on Android. NOTE no coordinates are displayed. The subject would need to provide the location to the searchers, since as outlined above most providers don’t use the phone’s GPS to report it’s position. This can introduce errors when the subject and the receiver write down the information wrong. Each phone brand, and even different providers, have different software; some phones do not come with software that can tell you the GPS coordinates that the unit has found, and most phones don’t report the accuracy of those coordinates. SAR teams receiving coordinates from a subject in the field must assume that there’s some error in the location. The error can be huge. In one search we did last year the subject with a iPhone attempted to determine their location, only to find that the display on the phone indicated they could be anywhere within a 2km circle. As a comparison, my team’s recent rescue a group that had a personal locator beacon is useful. In that case, the device was built with the sole purpose of notifying Search and Rescue that the party needed assistance. Even with this device there was confusion about the accuracy of the signal, and even with a perfect signal it was impossible to reach the subjects for over 12 hours. Mobile phones have several methods to determine their location. The network location is rough, and only valid when there is good signal and towers in all directions from the subject. This makes it almost useless for the backcountry. The fine location also has issues with accuracy, and the phone’s user generally has to report the location in some way (voice, text, email). Always attempt to determine the accuracy of the location. Always take the position reported with a grain of salt since even accuracy estimates can be wrong. Turn off the cell phones to conserve battery. If you only have a phone, learn how to get the GPS coordinate to display, and the accuracy. Figure out how to send coordinates to a trusted person. Another facet of the system that can come in to play is the E-911 capability, where a call to 911 from a GPS-enabled cell phone will relay that phone’s coordinates to the 911 call center. This should in theory provide the “fine” location referred above but of course is subject to errors in GPS accuracy. What does this mean for the person in need of help? Even if you’ve called or texted a friend and had them notify emergency services, it may still be advantageous to place a call to 911 yourself so that this position is relayed to the police and SAR. We have had a couple SAR operations in the past couple years where the police provided us with coordinates from the subject’s cell phone, and they were accurate enough that we were able to locate them quite rapidly. Not saying this is always the case of course, but it’s now a piece of information that we always try to obtain and see if it fits with the rest of the puzzle. Ed; Very good advice to always call 911 anyway just in case. I did a little digging into the E-911 system. According to what I’ve read it’s using the network, or rough location. Some phones can provide the fine location, but as I mentioned it depends on the phone and the provider. The E-911 accuracy seems to be limited because according to the specification it’s only required to be within 100m for 67% of the calls, and within 300m for 95%. These are US-based numbers. This leaves 5% which I believe accounts for phones which are still within the service area, but are on the fringes and don’t have more than one tower within range to provide triangulation. In one call we had for two missing men on Burnaby Mountain, the cell location was unable to narrow down the search area. In another search, the location was clearly so far away from where their vehicle that it could either mean that they had hitched home, or it was for the last place the phone “pinged” a tower. In several other calls the location was provided but the company stated that it was very rough. In only one call has the location been deemed to be accurate, and even in that case the person (a missing 12 year old girl) had turned off the phone, so it only told us where she had been 8 hours previously. However, we do almost always request the location of the phone when we start a search, it’s just that we have to take the coordinates with a grain of salt.